Home / Columnists/ Catwalk beyond 400 PPM – Consuming towards disaster! Catwalks sizzle! What’s on the catwalk – the skin, the silk, lycra parading endlessly broadcast to the world whatever new and popular in clothing and accessories and it also communicates desirable dimensions too in a not-too-subtle manner. Knowing the critical importance of textiles and apparel in meeting our needs and the necessity of keeping with the times, we have joined in our own way too. However, the creativity and inventiveness shown on our catwalks when we have them one has to recognise and admire too as that is a quality attribute that needs to be recognised. Catwalks perhaps define minimalism quite differently, though greening these events too is creeping in. This is however, about action! This is all about the need for some quick meaningful action where each one of us has to play a part. As we speak Australia is under a severe heat wave. Imagine that you have to endure 50 deg C – all-time records for temperatures. We complain even at 30 deg C. Well, the current story is some even stay and live underground in Australia – of course in one particular location for the moment yet! – to escape the heat. We know that much of Australia is desert and as such warm temperatures are not new. Yet the sizzling heat wave is one no one is enjoying. The issue is Australia usually is considered to be in the frontline in climate change. They will know it and feel it first. Accompanying other effects such as bush fires can be pretty devastating. Well I thought usually people escape on boats to heaven and not to hell! There should be a sense of urgency as the clock ticks and we remain much focused on consumption, which catwalks in my view epitomise. There was a time when New York was circulating yarn at one time through different neighbourhoods and then collecting garments from the same households in another round. Even today they are trying to resurrect that trade with ‘Made in New York’ label – well that is President Trumps in-shoring perhaps! Well today one of the bedbug dense cities of the world it is not really about stitching but all about fashion. There are many countries that fulfil that role for them. It is giving certain quotas or trade preferences that will do the trick in ensuring different value chains. Textiles do have very long distance relationships. As fashion was not fast enough fast fashion has emerged, energising the supply chains to be even more agile and responsive. If you can stich on the ship on your way to Americas, some may even do that. Some respond superbly, while most perhaps follow less than perfect pathways. These shortcuts and pursuant of cash flow and meeting demand at any cost can endanger lives and limb. If an order is delayed there are enormous repercussions. If one is not responsive and the season’s sales dip, then the end would be in sight. As such it is a serious business. Well it was for a reason that the concept of sweatshops has emerged. One event was to change that so much. 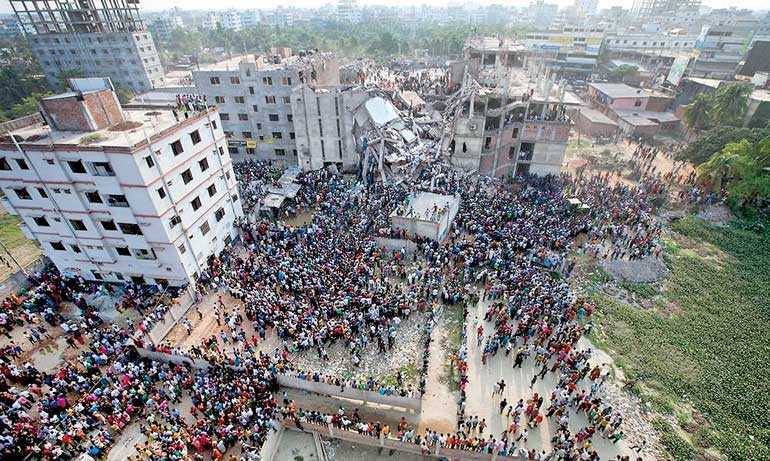 When the Rana Plaza collapsed on 24 April 2013 within 94 seconds, killing more than 1,100 employees and injuring over 2,500 in Bangladesh, it became the worst industrial disaster in recent times. It has been revealed that the production heads forced people to work on the day that the building collapsed, as deep cracks have been visible on the day before suggesting an impending failure. The pressure of commerce has blinded them. It is also important to mention that the top four floors of the building had been added without any permission and with the obvious intention of increasing capacity. The sights and sounds made global rounds and many of the buyers reacted sharply. Much more order in safety and work conditions perhaps was definitely brought into the industry. Yet the overall reason behind the situation has not changed much. We still want change and change happening in quick time in this industry and more have to make a living responding to such demand. Industries in this part of the world really depend on the purchase patterns of the markets in the west. Some emerging trends such as ‘no bra’ movement after the #metoo definitely can be bit unnerving for some. When high end fashion houses has to change their associated slender images the systems developed to serve a fixed image – the ad look – is haunting some of the dependent industries. It is important to mention the Sri Lankan apparel sector however is currently leading not only with ethical fashion and Garments without Guilt but in greening as well as in innovation. It is interesting to watch the Colombo Innovation Tower rising to serve design. Still I would caution some mindset changes are necessary and faster the better. Even though we may be in high-fashion and high end exporter, we cannot very well serve on something as simple as providing quality school uniform. Climate change is the most haunting prospect in store for us on this planet. What is critical is even if we have been explained the science and the reality too has been evident some of us and even those in very high places ignore and contribute by doing what exactly is not prescribed. The issue is this is not just endangering a few but almost all! We note that on 20 January this year, the CO2 value recorded has been 413.21 ppm as the daily CO2. A year ago on the same date the value had been 408.09 ppm. It was on 10 May 2013 that the CO2 reading crossed for the first time again after about two to three million years the value of 400 ppm. It is an imperative that we must understand the negative consequences of this rising value of this particular gas in the atmosphere. The isolated pioneering effort of David Keeling who developed and measured the atmospheric CO2 in 1959 had been kept going and the CO2 curve named after him had shown steady but a slow climb. This sadly is not conquering another summit for the human kind but more likely the demise. Another worry is we just do not know the value when the point of no return is likely to happen – 420 ppm or 450 ppm. Today the prospects of a 420 ppm looks alarmingly closer. In such circumstances we again hear of the release of other gases such as CFCs, which too have a more serious global warming effect, by countries that consider the economics of these gases is to be utilised in their SMEs even though they have been banned for many decades. 400 ppm should have been the day for action but that really did not happen. The issue is reckless, unsustainable consumption and the inability of us to reign in this habit. The sustainable development goals specially consider the importance of this by identifying it as SDG 12. Nationally the policy for Sustainable Consumption and Production is ready and available, though yet to be adopted. Yet when growth is aspirational and higher numbers are revered with the mechanism to achieve greater numbers is only through production and consumption there is a serious disconnect on what we should do and doing. When fashion festivals move from a city to a city and non-stop catwalks occupy and titillate the senses, possibilities are quite remote in controlling consumption. It is quite interesting to note how this trend may have begun indicating that consumer society was not an accident. It must be said that over the years the expectations of people like Victor had been very well met. We all know once the addiction has set in rehabilitation is not easy and definitely costly.